"Portrait of a Survivor 2" by Jessica Monroe. Jessica Monroe’s new art exhibition, “Art Ecologic,” is about reconnecting to the natural world. Sponsored by the Upper Valley Art League and installed in the Kika de la Garza Art Center, this series of paintings explores relationships between specific subjects, such as a bird or flower, and the environmental energy around them. The artist focuses on the local ecology with a first-hand interest in native species of the Rio Grande Valley. This large showing of her work also includes a few older pieces, which although addressing nature, do not adhere to her current theme of our local ecosystem. However, her works always combine her intellectual convictions with an exuberantly rhythmic and beautiful brush technique, providing the viewer with both pleasure and information. Collected with the assistance of local nature centers, there are displays presented as miniature sculptures comprised of native seeds to compliment the surrounding paintings of plants, birds and butterflies. Monroe points out that seeds hold the potential for life, not only of plants, but of all the insects, birds, and microorganisms the future plants will support; they are the foundation for the wildlife shown in her artwork. 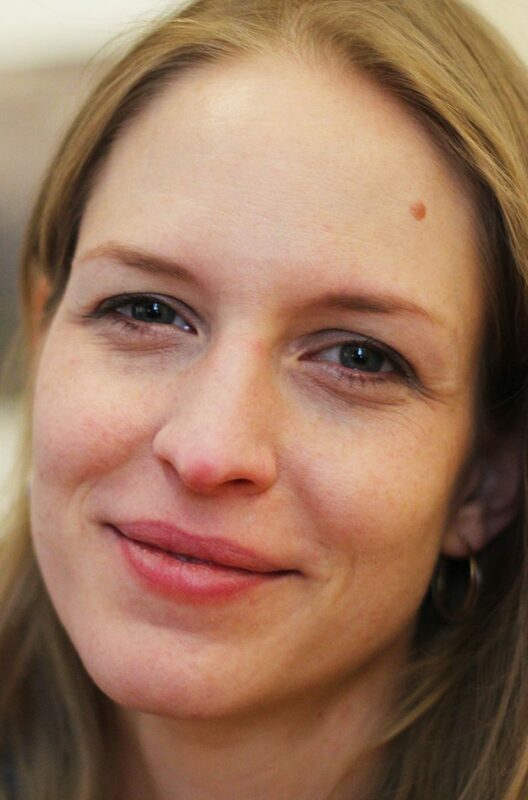 With “Art Ecologic” Monroe wants to increase our awareness of our natural local world. "Peacock Pair" by Jessica Monroe. 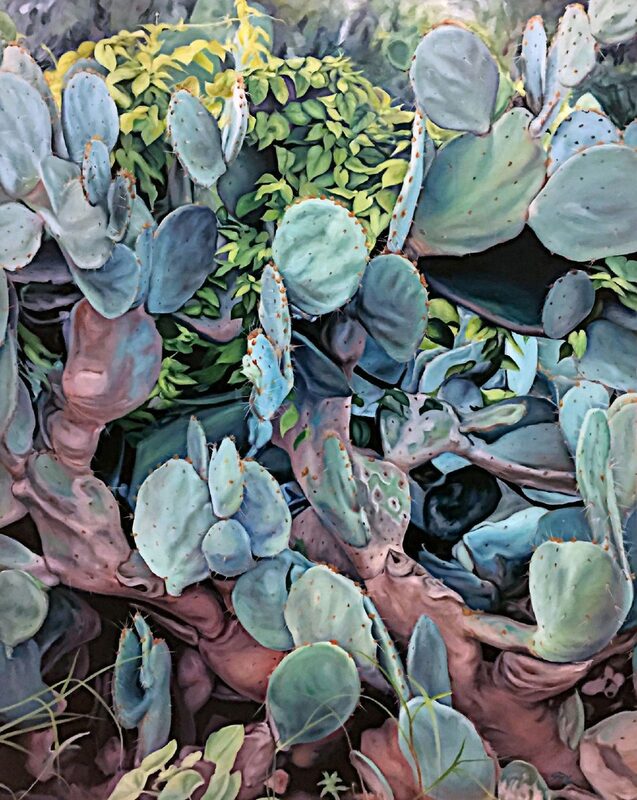 "Abuelita’s Cactus" by Jessica Monroe. 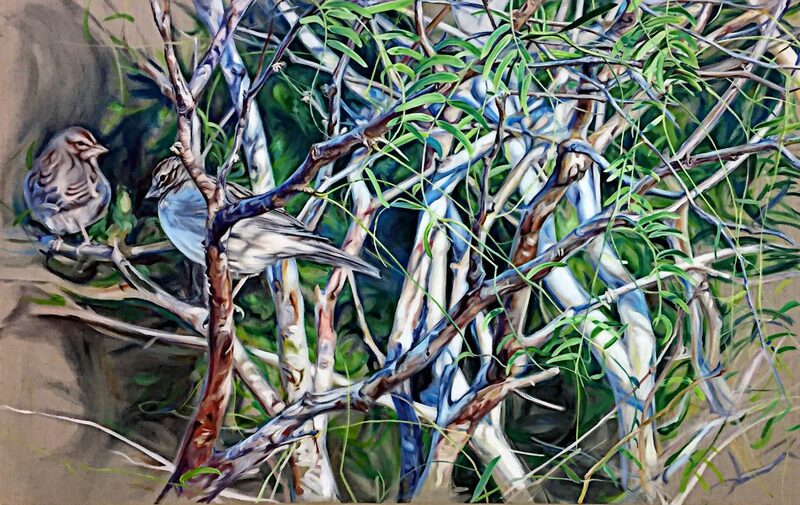 "Lark Sparrows" by Jessica Monroe. 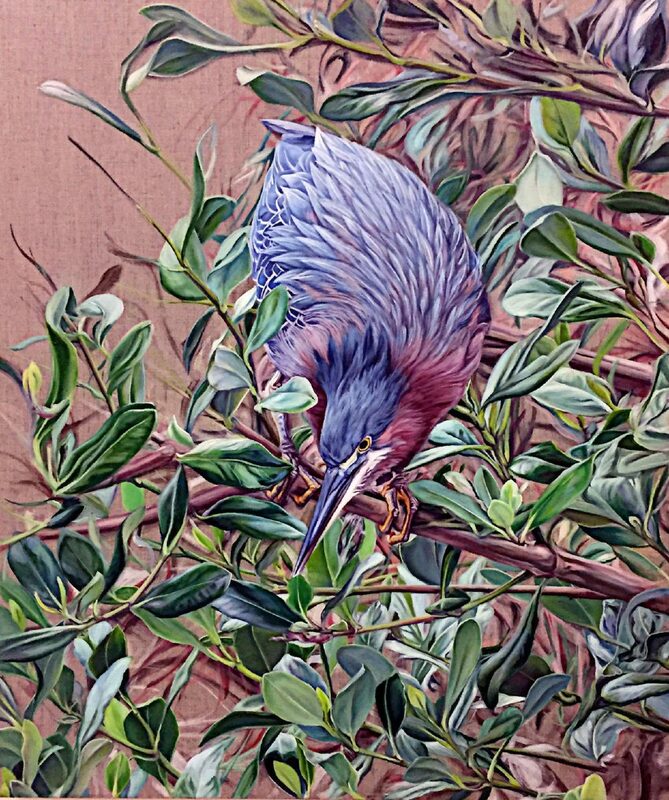 "Green Heron" by Jessica Monroe. Many of the paintings leave the background as unpainted linen canvas, counterpointing well with her natural imagery. In the entrance piece, we confront a “Green Heron” perched on a dynamic tangle of brush; our view is dramatically directed down over the bird’s back. 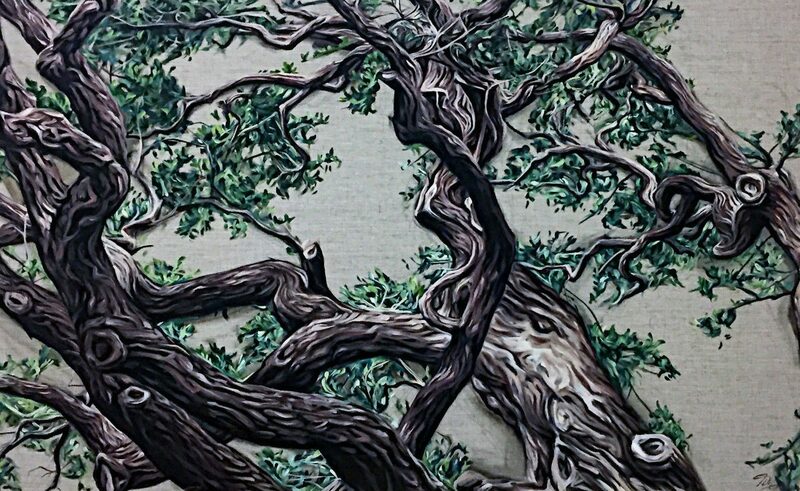 In her complex pieces, Monroe takes advantage of tangled diagonals of plant life emphasizing the inner energy of her subjects as in “Portrait of a Survivor 2,”which depicts an old and much pruned tree that is still a fierce contender, succeeding in its battle for undying dominance. 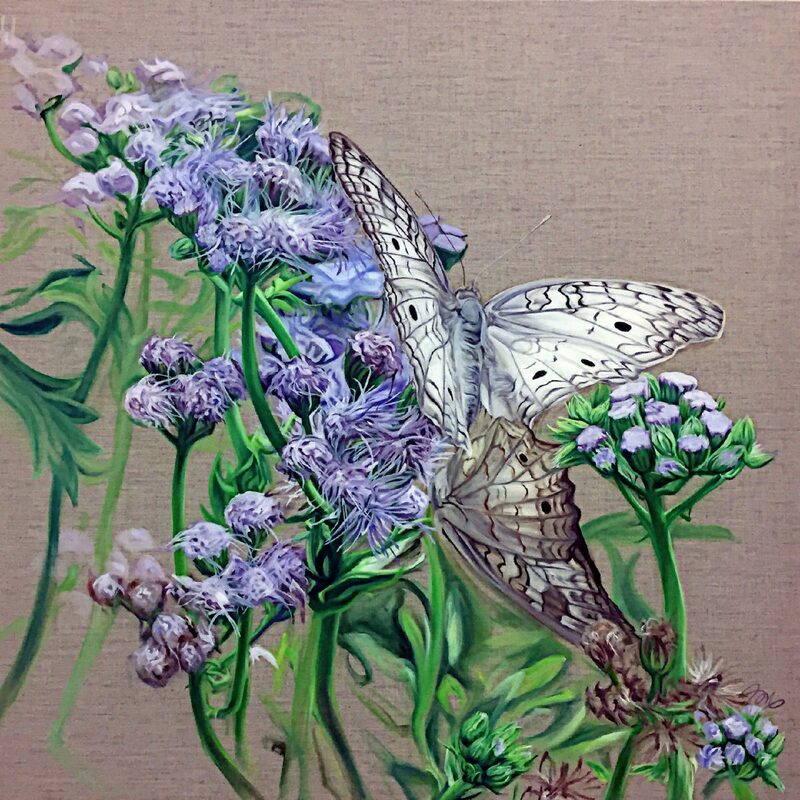 An activist on behalf of the local ecosystem, Monroe has shifted her attention to portraying scenes reflecting that ecosystem, being careful to portray her butterflies and birds with their correct food source. She painted the Mexican milkweed for her Monarch butterfly image. Much of her inspiration comes from the local nature centers. The artist’s toddler seemed to broaden her artistic focus; she confessed that she collected the seeds because she was with him. “He forced me to stop and do things that I wouldn’t normally do if I were just a painter,” she said. With these displays, she encourages all of us to share her physical experiences with nature. At the opening reception, she offered “seed bombs” made up of wildflower seeds that viewers could take, throw onto the hopefully fertile ground and become part of what Monroe is about.